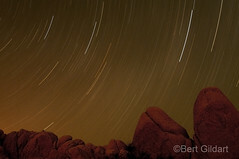 ©Bert Gildart: The Challenge: Because light pollution is so pervasive, areas of the country endowed with a Dark Sky Status should be celebrated. Obtaining appealing images, however, requires long nights in the field and some technical knowledge. I wanted to suggest that the spirit of Chief Joseph still wanders his ancient tribal land, and felt the combination of teepee poles at the Big Hole back-dropped by star patterns would create that effect. Exposures on my several cameras (from about 1 a.m. to about 3 a.m.) were many but shutter speed averaged about 45 minutes. My aperture was 5.6 and ISO generally set for 400. Additionally, I “painted” the teepee poles with flash and set my strobe so it fired at about f8, or one stop under my overall setting. 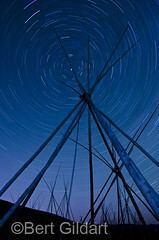 The image will appear in my book Montana Icons, scheduled to be released in several weeks by Globe Pequot. 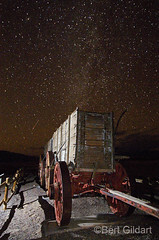 AND, the image will also appear in the upcoming issue of Airstream Life, used to illustrate my story on Dark Skies. Final Thought: Help reduce light pollution and preserve areas blessed with a Dark Sky Status by using your night images to celebrate and call attention to these vanishing “islands”. This entry was posted on Thursday, August 23rd, 2012 at 8:28 am and is filed under National Lands, Natural History/Conservation, Photography, RV Travel, Uncategorized. You can follow any responses to this entry through the RSS 2.0 feed. You can leave a response, or trackback from your own site.